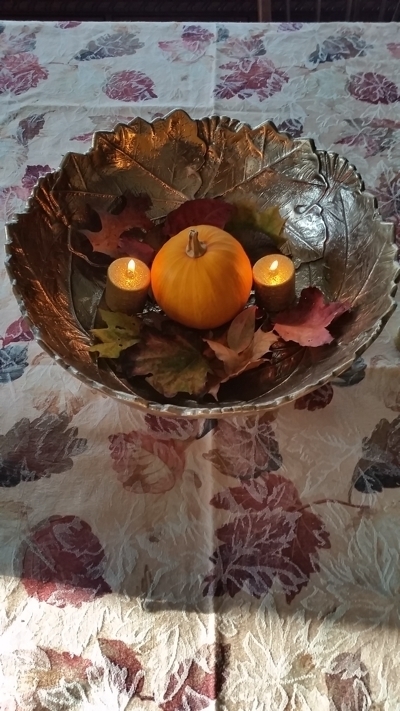 An Autumn themed bowl filled with foliage and candles. Pumpkins are also great accents to any centerpiece because they are a representation of the season. When decorating for any holiday it is important to keep a constant color scheme or central theme throughout all of your decorations or else you run the risk of creating an unorganized and disheveled environment. For Thanksgiving the perfect color schemes would include shades of red, yellow, orange, brown, gold, cream, and purple. 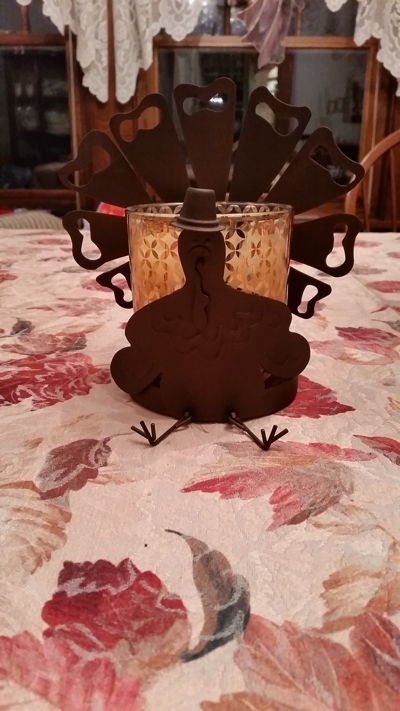 Some themes could be; leaves, gourds, or turkey. An example of a gourd theme would be using assorted gourds as candles, centerpieces, or gourd printed napkins. Use fun, festive decor to accent your table. 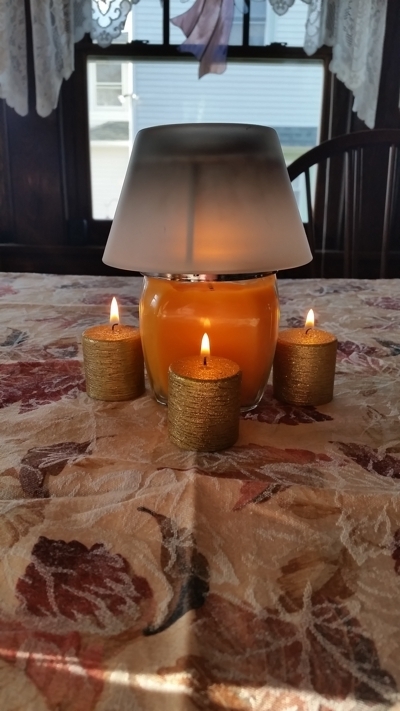 To create a warm and inviting atmosphere I would suggest using candles, especially candles that smell like cinnamon, apple pie, pumpkin spice, or any other Autumn themed candle scent. Candles create a welcoming atmosphere. They also come in all shapes and sizes. Using different candle heights and widths creates a unique decoration. Candles are a great way to create a warm and inviting atmosphere. When it comes to centerpieces make sure they are not too tall so everyone is able to hold conversation across the table without having to look over the centerpiece. A centerpiece should grab the attention of your guests, but it should not take up too much room on the table because there needs to be enough room for all of the food. When creating a centerpiece, try to convey a wow factor without overdoing it. 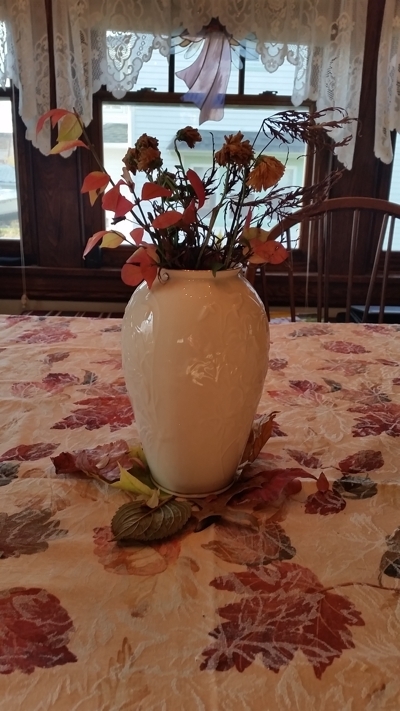 Examples of great centerpieces are; a short vase filled with a bouquet of mums, a wreath made of leaves with a pumpkin in the middle, or, a Thanksgiving or Autumn themed candle holder with a candle in it. Also, when thinking of centerpieces leave room for the imagination. Using foliage and bright colored leaves still attached to sticks is a great way to create an Autumn themed bouquet. Also, using mums would be perfect for an Autumn bouquet. A classic place setting that looks elegant and is easy to create. Besides centerpieces, other table decorations include table settings. Table settings include; a plate, napkin, silverware, and sometimes a placecard. 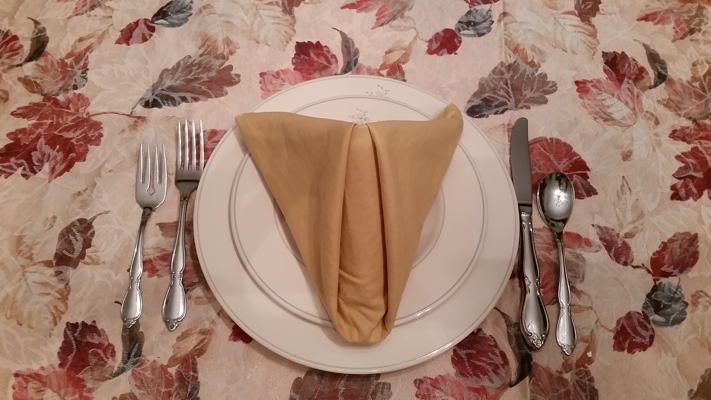 Creating a table setting depends on what one chooses to do with a napkin. Napkins can be folded, or a napkin ring can be placed on them for a simple look. Adding a placecard depends on who you want sitting next to each other. Place Cards are not necessary for a table setting, but they make seating feel more personal to your guests. 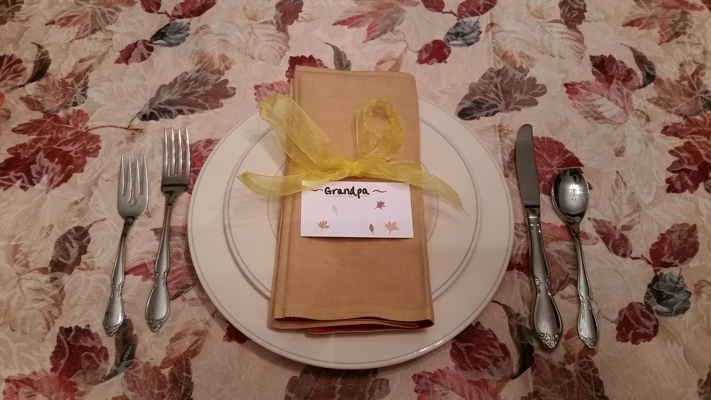 Using a festive place card makes your guests feel like you took your time to personalize each setting.